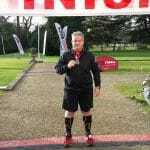 This week it’s Michael Tighe who took part in the Westonbirt 10K with us last year. “I had a brain tumour which was removed successfully but since that operation, 14hrs worth, I have suffered from chronic headaches. A lot of the time all I can do is stay in bed in the dark until the headache reduces in severity. I have had my current headache since November 2002. One day in 2012 I was out walking and it chucked it down with rain so I ran home. I realised that with this lower level of headache running did not increase the pain and that perhaps running was a possibility. I took up running with the aid of a personal trainer who was also a good friend. Slowly but steadily I was able to run further and faster. I got stronger physically, fitter and with this new positive element in my life better able to cope with dreadful levels of pain. The feeling of freedom I get when I’m out running is fantastic. I feel more alive and know I am achieving something that day whether it be a 4km or a 10km the achievement stands. I relish the time when my headache is low enough to let me run and make the most of it. Negative thoughts are destructive. In my situation focusing on the positives, however small, spurs me on and gets me through. The medals I have gained from runs like the beautiful Westonbirt Christmas 10k signify achievements. Challenges met and overcome and days spent mixing with great people of like mind. I have 18 medals to date and when I have to spend three or four days in bed with a high intensity headache they are on the wall and knowing that helps me bear what I must.